Diet along with exercise has positive effects for those who have diabetes. It can lower blood sugar levels, improve insulin sensitivity and strengthen the heart. Exercise demonstrates positive effects on both the cardiovascular and pulmonary systems by assisting to oxygenate the blood. These systems are both directly affected by diabetes. The cardiovascular system is affected by a decrease in the diameter of arteries, due to an increase of fat deposits creating stress to the pulmonary system. When cardiac output is increased through exercise, the respiration rate also increases to properly oxygenate the blood. This entire cycle is caused by the increased blood-glucose levels in a diabetic patient. An increase of glucose in the body’s vascular system, and the inability to absorb it, leads to many complications including an increased amount of sorbitol that is deposited around nerve cells. This can cause diabetic neuropathy, which is damage to the nerves of the body. Sorbitol is a sugar alcohol that is often used to sweeten many processed foods, including frozen desserts, baked goods, sugar-free candies and chewing gum. In the body, an enzyme known as aldose reductase converts glucose into sorbitol. This process occurs in everyone to a degree, but in those with diabetes, the conversion of glucose to sorbitol is greatly accelerated. Sorbitol is not used by the body, so it takes a long time for the body to rid itself of the sugar molecule. As more food items are made with sorbitol and consumed by diabetics, combined with the accelerated conversion of glucose, sorbitol can build up over time. When it does, it depletes the body of essential nutrients like vitamins, minerals and amino acids. Excess sorbitol in the bloodstream also attracts water and causes cells to swell, which can eventually result in serious diabetic complications such as vision problems (retinopathy), nerve damage (neuropathy), kidney problems (nephropathy) and blood vessel damage. The main goal of exercise is to begin the management of blood glucose levels. Blood glucose levels are decreased during periods of exercise. Glucose is lowered by exercise due to increased permeability to glucose in cells. Strength training, which increases muscle and reduces fat, can be helpful for people with diabetes. Aerobic exercise can also offer a workout to multiple muscle groups. This exercise increases blood circulation through muscle groups of the feet and hands. This increase in circulation lessens the chance of neuropathy. Aerobic exercise also increases stroke volume and heart muscle contractibility thus increasing vascular efficiency. The most crucial guideline for a diabetic patient is to check blood glucose levels. Before any exercise programs, a complete medical evaluation should be performed to obtain baseline measurements. Patients must check their blood glucose levels when performing exercises. 1. Footwear: Proper footwear is to protect patients from incurring any injuries during exercise. With decreased sensation from neuropathy, the feet must maintain injury free from bruising and blisters. If not, injuries will take longer to heal, thus causing the patient an extended period away from their exercise program. 2. 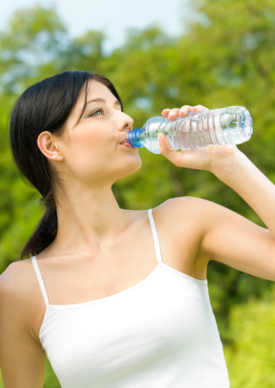 Hydration: Proper hydration is one of the most important factors in an exercise program. Hydration should not be with sodas or sugary beverages, which will alter the blood/glucose levels. Hydration with water should occur before the onset of thirst. 3. Snacks: The importance of a snack is to increase blood glucose levels in cases where glucose levels are low. These snacks should also be readily available. Regardless of the cause of your diabetes, improved lifestyle factors will reduce the damaging effects of this condition. The combination of chiropractic adjustments, nutrition, exercise and detoxification will promote healing, reverse disease and maintain neurological balance that is critical for living to your health potential. What can I do if I don’t have time to exercise? Starting with just a few small changes you can help get your body in shape and your health back on track.